Home energy storage is all the rage now, thanks to the introduction of Tesla’s Powerwall. BMW threw its hat into the fray this week at the Electric Vehicle Symposium & Exhibition 29(EVS29) event in Montreal, Canada. BMW’s system would focus on giving a second life to the batteries used in the BMW i3, making the vehicles greener than ever. 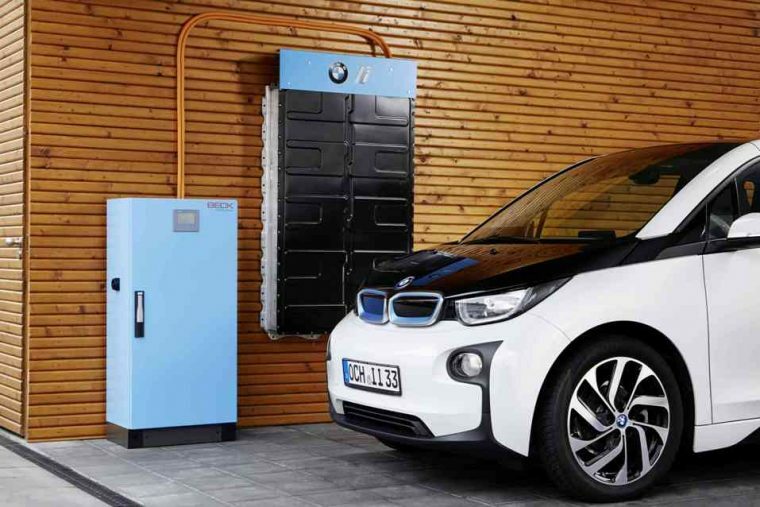 According to BMW, when batteries are done serving their purpose in its i Series vehicles, they still maintain much of their energy storage capacity. These batteries, and new batteries, can be used in the proposed BMW system as an energy backup for a home. A house that generates its own electricity, such as with solar panels, can store excess electricity in the BMW batteries for use with the alternative source is not available, or in peak hours when any energy from the grid would be more expensive. The batteries can also provide power to a home for a limited time if the power from the grid should be disrupted due to damage, replacing noisy generators that can fill a home with carbon monoxide if not used properly. Currently, homes with solar or wind power gathering tools feed excess energy back into the grid instead of using it. BMW is partnering with BECK Automation in Wurzburg, Germany, to integrate the batteries into a system, so there is currently no release date slated for the device. BMW hopes that the system will help i Series owners make their lifestyles as a whole more green, beyond just the purchase of an electric car.